The PV200USB features an AC outlet, a 2.1A USB port and a 1.0A USB port. 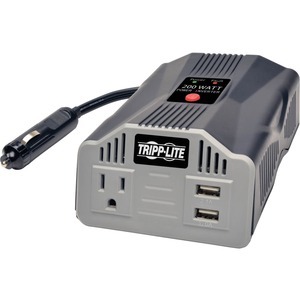 Just plug the DC input jack with convenient 3-foot cord into the 12V cigarette lighter socket in your vehicle, press the On/Off button, and the unit is ready to operate. Easy-to-read LED lets you know the inverter is receiving power from the battery. To prevent you from running down your car battery, the PV200USB turns off automatically when the input voltage falls to 10V. Likewise, the unit will also shut down if it gets too hot (for instance, because your connected devices exceed 200 watts). A built-in ventilation fan keeps the interior cool during extended use. The durable plastic housing is engineered to withstand the rigors of road trips, campouts, business trips and family vacations. No maintenance is required.